If you are looking for the hottest holiday gifts this season, look no further than your local Showcase store (or online at ShopAtShowcase.com). You can count on them to find exclusive, hard-to-find trends in a variety of categories like beauty, technology, toys and home. One item I’m suggesting you add to your shopping list for a foodie in your life is the Instant Pot, a 7-in-1 programmable cooker that will change the way you cook. Showcase recently sent me one to try and so far, I’m super impressed! When I first heard about the Instant Pot, I thought it was just a regular pressure cooker. Turns out, it’s that and so much more. It’s a slow cooker, steam, rice cooker, porridge maker, yogurt maker, warmer and more all in one easy to use appliance. With space a luxury in many kitchens, it makes more sense to have one appliance with multiple functions than buying a separate one for each. Plus, you’ll save money because you won’t have to buy all those appliances separately. It’s a smart budgeting decision if you ask me. Another cool thing about the Instant Pot is that you’ll save time in the kitchen. You can prepare your favourite foods in as much as 70% less time. That means you’ll be spending less time in the kitchen and can get dinner on the table for your family much more quickly! Uses less electricity. Because it needs less heat and less time to cook your food, you’ll get a 70% energy savings over conventional cooking. Simple to operate. It’s as easy as pushing a button to start the cooking process and flipping a switch to release it. You won’t have to baby-sit the food as it cooks. Easy to clean. All of the splatters are contained within the Instant Pot insert instead of all over your oven or stove. Safe. It has 10 proven safety mechanisms so you can use your Instant Pot with confidence. It comes with an easy to follow instruction booklet and recipe booklet. 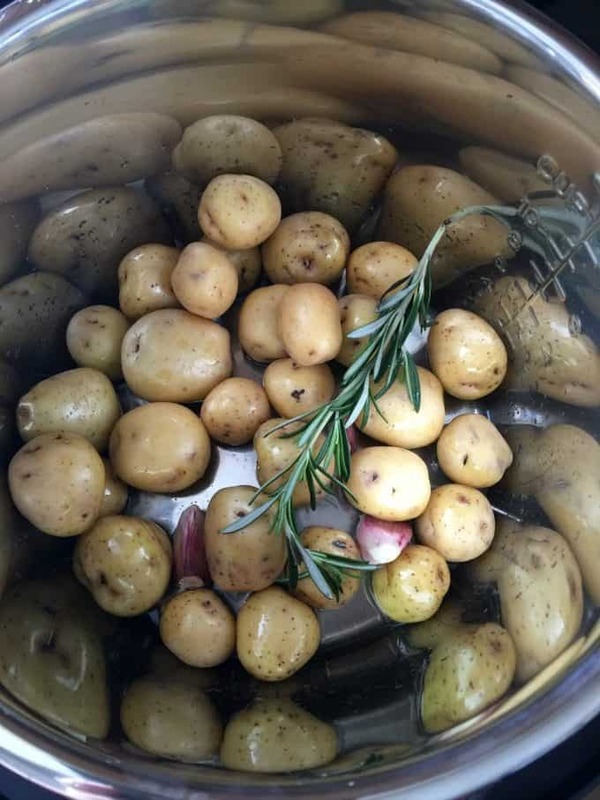 Since it was my first time using the Instant Pot (and a pressure cooker), I decided to try out one of the recipes in the booklet: Roasted Baby Potatoes. The first step was to saute the potatoes, garlic and rosemary in some vegetable oil right in the Instant Pot. Yes, it sautes too! Just press saute and wait for it to heat up. Once it says HOT, you are ready to add in your ingredients. After I’d sauted the potatoes for 10 minutes, it was time to finish the cooking process. I set the Instant Pot on manual for 11 minutes at high pressure. Then I tidied the kitchen while the Instant Pot was pressure cooking the potatoes. It was so quiet! When it was done, it beeped. I release the pressure and opened the lid. Inside was my perfectly cooked potatoes. They were so tender and flavourful with hints of garlic and rosemary. I loved how easy and fast they were to make. The Instant Pot is going to save me so much time in the kitchen. It’s a handy appliance to own for people with busy, active lives. I know I’ve only scratched the surface with what my new Instant Pot can do. I can’t wait to try out the rest of the functions! I’m like a kid with her new favourite toy! Visit Showcase to learn more and to buy your own Instant Pot either for yourself or as a holiday gift. What will you make first in your Instant Pot? Perfectly tender and flavourful, you’ll love how fast it is to make this delicious side dish with your Instant Pot! Press SAUTE to pre-heat the Instant Pot. Once the display reads HOT, add in the vegetable oil, potatoes, garlic and rosemary. Gently roll the potatoes around to brown the outside for about 10 minutes. Press Cancel to stop the SAUTE cooking process. Pierce each potato with a sharp knife. Pour in chicken broth. Close and lock the lid of the Instant Pot. Press MANUAL and use the + and – buttons to set to 11 minutes pressure cooking time. When the time is up and the Instant Pot beeps, precess CANCEL and move the steam release handle to venting (this is the Quick Pressure Release process). 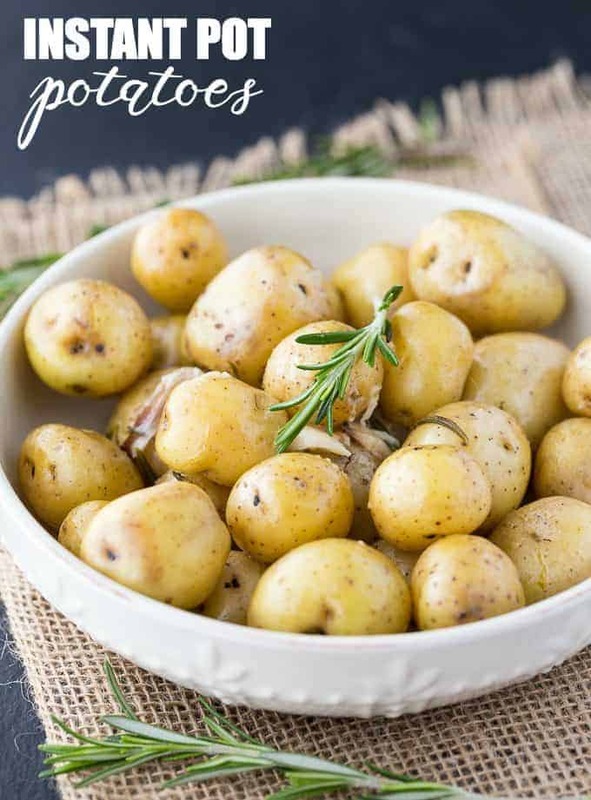 Move potatoes to a serving dish and season with salt and pepper. Serve hot. This looks like an amazing pot to have! I just got one of these and they look great. I haven’t used it yet so I can’t comment on how it works but am so excited to have it. I love to have an Instant Pot. I am been thinking about it for awhile now. I loved my old pressure cooker. My sister has one of these and I’ve been so impressed by it. May have to grab one for myself. 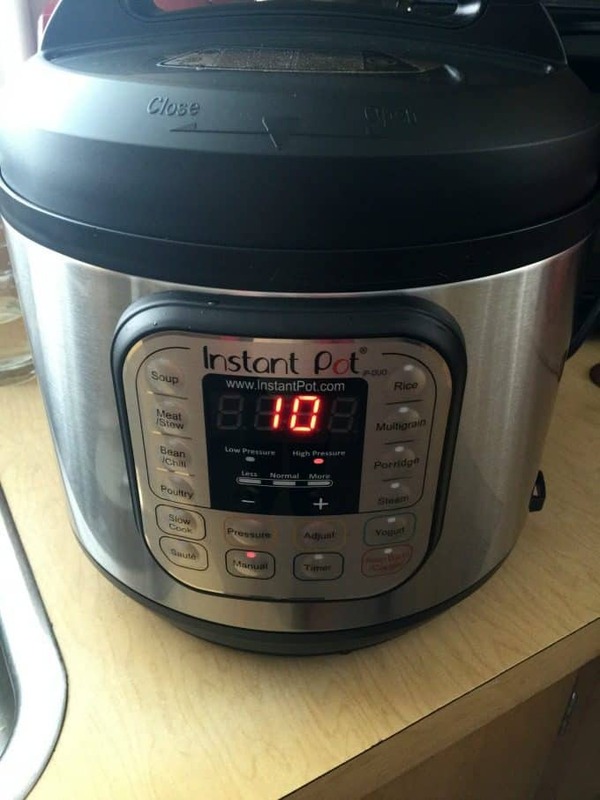 I have heard great things about the instant pot! I would make side dishes to free up my oven and stove top and make your potato recipe. It is a good side dish for me to try! 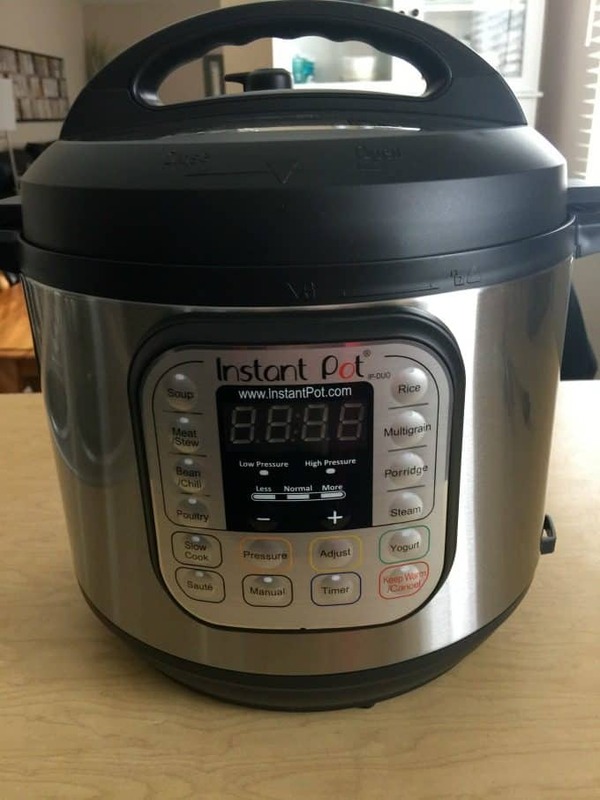 I have read amazing reviews about the Instant Pot, I think I might just have to put one on my want list! Thank you for sharing this wonderful recipe,will try it soon! Those little potatoes are always so tasty. 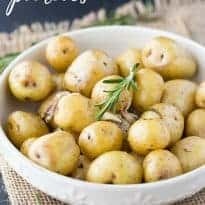 I love rosemary and garlic potatoes – this cooks them so much faster than the oven. I would probably use it to make a stew. I love stews but they take time. I know it would be a breeze in this Instant Pot. I am amazed at its short cooking time and how versatile it is. Thank you for telling us about it. This is on my wishlist. Hopefully gonna get soon. I just got an instant pot for Christmas and I’m trying different recipes out. I made these tonight and they turned out really good! I cooked the potatoes as stated and put them on the bottom and tented pork chops with tin foil on the rack above them. It was great to have a whole meal done together so quickly! I did a natural release because I read he directions wrong and the potatoes were slightly mushy but still awesome with tons of flavor. I only cooked half the potatoes so I’m gonna do the rest by themselves using this recipe with a quick release. Thanks for the great and easy directions it’s a huge help for a newbie!